Here on The Bioscope we’ve had several items on the digitised newspaper collections that are available online, both for free and via assorted subscription options. The latest news on this front promises to be the most significant such resource yet, especially for those of us interested in researching the history of early film. The New York Times has been available in digitial form back to 1851 for some time now, under subscription. Two things have just occured. Firstly, the NYT has dropped its subscription scheme, and now offers free access to its archives back to 1987, and for articles between 1923 and 1980 articles are available for purchase at $3.95 a time, or a ten-article pack of $15.95 (over a period of thirty days). But the sensational change as far as we’re concerned is that everything before 1923 is now held to be in the Public Domain, and hence is being made available for free. The documents are available in PDF format only, though keyword searches operate across the whole texct, not just headlines. To access the service, go to the New York Times front page at www.nytimes.com and type in your search term in the search box, then select the option NYT Archive 1851-1980. If you are searching for a phrase, put this in inverted commas. You can sort the search results by closest match or date – newest or oldest first. Each result gives you the opening lines of the article, then the option to view the whole piece in PDF format. Articles from 1923 onwards give you a free preview of the opening lines. The first few searches are uninterrupted, but then it seems you have to register (for free), for which for some reason they want to know what you earn, your profession, and the number of people employed in your company. You may deal with such hurdles as you see fit. With this, the Chronicling America resource, and other newspaper collections covered in the Times Past and More Times Past posts, the research opportunities are just huge. How lucky we all are. This is indeed a further amazing development in online resources. The amount of online material related to our field of silent cinema and to other fields too is becoming vast. Newspapers, periodical articles, books are increasingly available. 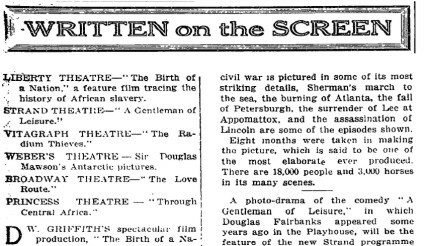 When I first began research about early cinema over 2 decades ago, as a first step I decided to search the available printed indexes, such as Readers’ Guide, Industrial Arts, etc, and newspapers such as the Times and NY Times. But the digitisation of the original media as full text has made such printed indexes of far less importance, as both the indexed articles and extra references can be found through keyword searches. This is a boon for researchers, and also implies cost savings in travel and purchase of materials. It is, these days, becoming far less necessary to visit libraries, because so many periodicals/newspapers are online, as are many books. The Internet Archive has already saved me $$. Here’s an example. I want to re-see a copy of ‘The Film of Fear’, an early film-related novel of 1917, which I’d had a quick glance at in Cambridge UL. It is available there and other copyright libraries in the UK, but with limited opportunity for xeroxing. So yesterday I thought I’d search for it in the amazing Internet Archive, and it’s there! In full, and in the 1917 original ed, rather than the 1922 reprint which Cambridge has. The only other way I could have seen it would be to purchase from bookdealers (AbeBooks etc), but these copies go for a minimum of $40 or so (plus p&p). One caveat. While books and newspapers are become more available online, many periodicals are not. Either these have not been digitised or they are only available via subscription services: i.e. you must pay. Thus, membership of a library is still required. But this isn’t necessarily a big stumbling block, and the US libraries are especially generous in allowing researchers to download material from such subscription services. One tip: the NYPL has a good tranche of such resources and for those who don’t live or work in NY area, outsiders can gain access for $100 per year. Cheaper than going there! It’s a good point that paying a subscription is not such a dreadful thing if you are serious in your research. It is marvellous that so much is made freely available (and that more and more is going to follow), but it is not unreasonable to pay for access to resources which have cost many thousands to published online, and which have saved the researcher from travel bills and a good deal of wasted time and effort. The flexibility of many subscription schemes (per view, per day, per month etc) is also a great boon. I hadn’t heard of The Film of Fear. I will be adding fictional works on films from the Internet Archive and Gutenberg to the Bioscope Library in due course – Merton of the Movies, The Moving Picture Boys series etc.